I love this challenging quote. 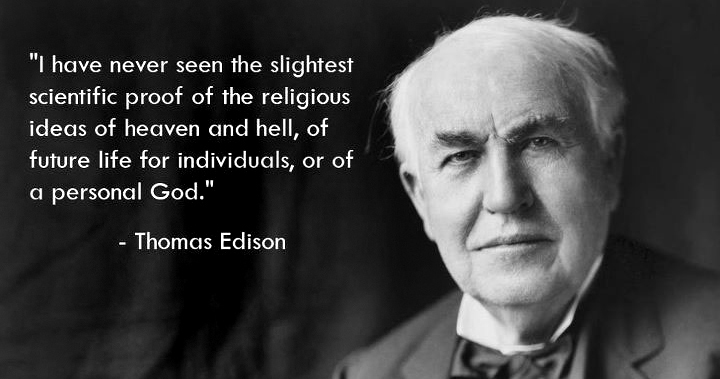 At the same time, I’m mystified as to why atheists consider it so credible, given that it was spoken by a man (definitely a brilliant man) who died in 1931. It’s hardly a stretch to write that there’s been a whole lot of research done since then. Without getting into boring details of studies and terminologies (anyone who needs that stuff can certainly find it online), I’ll toss out a few interesting tidbits. On life after death: In 1991, Pam Reynolds had a near-death experience while undergoing surgery for a brain aneurysm. Reynolds was kept literally brain-dead by the surgical team for 45 minutes. Despite being clinically dead, when Reynolds was resuscitated, she described some amazing things — like interacting with deceased relatives. According to Time magazine, as many as 18 percent of people brought back from death after a heart attack said they’d had a near-death experience. On the existence of Heaven: In 2008, neurosurgeon Eben Alexander III suffered an E coli meningitis infection which attacked his brain and plunged him deep into a week-long coma. Brain scans showed that his entire cortex was not functioning. Against all odds, Mr. Alexander woke up a week later. And he claimed to have experienced something extraordinary: a journey to Heaven. In his book Proof of Heaven: A Neurosurgeon’s Journey into the Afterlife, he asserts that there is an eternity of perfect splendor awaiting us beyond the grave, complete with angels, clouds, and departed relatives. “God even knows how many hairs you have on your head” (from a section called ‘Luke’ – even my wife can’t make that claim). “Before I made you in your mother’s womb, I knew you” (from a section called ‘Jeremiah’). Granted, none of this is the scientific proof that many people demand. But let’s be honest here: the creator and master of time, space and universe, who’s responsible for the air you are breathing right now, will ALWAYS be beyond proving or disproving. God will ALWAYS be past our ability to fully comprehend. Looking for a metaphor? It would be like asking a porcupine to understand the theory of relativity. 2. God wants to have a personal, eternal relationship with YOU, but there’s a barrier in the way: the wrong things you’ve done (including living your life as if He doesn’t exist) and the right things you haven’t done. 3. You can never do enough to make up for the wrong things you’ve done and the right things you haven’t done. 4. You don’t have to. Jesus Christ, whom serious Christians (and many others) consider to be God’s son, did the heavy lifting for you when he died to make up for the sins of everyone who accepts Him and believes in Him. 5. All you need to do is accept the gift of Jesus; make Him your lord and saviour, so you can see your life transformed NOW and have eternal life with Him.